Finally! My computer has made it's way back home with 340 brand new gigabytes of storage and a salvaged Iphoto library. Phew. I have quite the back log of recipes to share but thought I would start with this chili recipe since it seems to be highly coveted amongst several readers! We are continuing to lighten things up around the Sheridan household in preparation for bathing suit season. Although I have never officially done any kind of prescribed diet program( i.e Weight Watchers, South Beach, Eat Clean, Atkins etc), I seem to own every diet cookbook on the market. Whether you diet or not, having a plethora of nutritious recipes on hand is essential for a well-balanced, healthy lifestyle! This smoky turkey chili is adapted from a Weight Watcher cookbook I have. My adaptations include omissions of a few ingredients that would only add to the points value and in my opinion leaves the chili with an unnecessary sweetness. I will post the points value as stated but know that it will be a point or so off (in your favor!). Prep Ahead Plan: I think this is the first chili recipe for the slow cooker that does not require browning the meat first! Using 99% fat free turkey breast leaves little to no fat to drain enabling you to toss all of the ingredients in the night before and when you wake up, set it and forget it. 1. Combine all ingredients in your slow cooker. Stir to combine, breaking up the ground turkey with the spoon. 2. Cook on low 8-10 hours. Hot Browns for Derby Day! 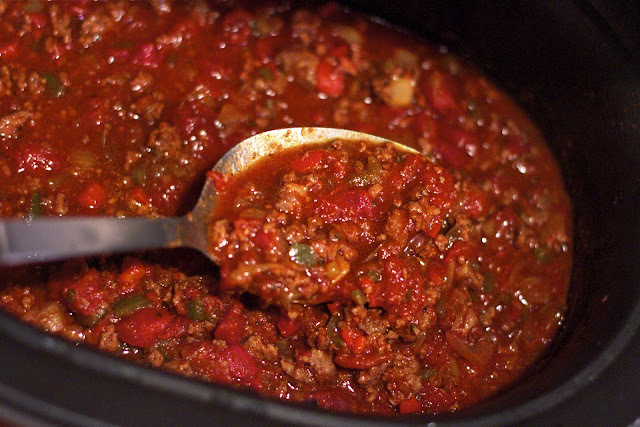 Copyright © PrepAhead and Dine In: Smoky Turkey Chili ~ a slow cooker Weight Watcher recipe. All Rights Reserved.